Crews Friday morning were getting to work cleaning up the damage in Lawrence, North Andover, and Andover from Thursday evening’s gas explosions that killed one man, damaged dozens of homes, and left thousands of people without power. But officials warn it could be several days before things are back to normal in the Merrimack Valley towns. In the meantime, shelters are open, schools are closed, and utility crews are going door to door to check homes where gas had to be shut off Thursday night. Emergency crews fought dozens of fires Thursday night, but they are all now extinguished, said Kurt Schwartz, director of the Massachusetts Emergency Management Agency. Governor Baker announced that he is declaring a state of emergency in the three communities and putting Eversource in charge instead of Columbia Gas. 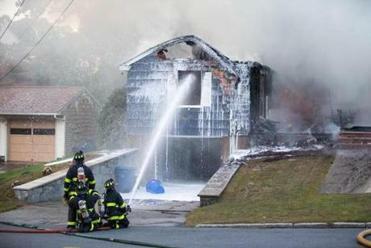 The danger, at this point, is mainly from any pent-up gas that leaked and remains in homes. For that reason, utility crews are going door-to-door checking for gas leaks and turning utilities back on. So while the worst of the fires may be behind us, officials say, it’s still important to take precautions. Don’t go home until you get the all-clear. Police, fire, and utility crews will need to visit each of the approximately 8,600 affected homes to shut off and restart gas meters and conduct safety inspections before the homes are safe for normal activities. Please do not turn gas back on yourself, officials stressed. Officials say the process of inspecting homes could take at least a day, and they ask residents not to return home until you get the all-clear. If you must enter your home briefly to retrieve medication or other essentials, you can, Andover police said. But they recommend using “extreme caution,” and to call 911 immediately if you smell gas or other odors. Lawrence Mayor Dan Rivera recommended staying away until buildings are cleared. Andover and North Andover are updating lists of streets where homes have been inspected and cleared on their websites. They said that even if your street is cleared to return, only a utility crew should restart gas service. In more densely populated Lawrence, the process of inspecting and clearing buildings is more complicated and being done in concert with electrical utilities, Mayor Dan Rivera said. They plan on reopening affected parts of South Lawrence in larger sections at once. “We don’t want folks coming back to an apartment that’s not been cleared and have an issue with gas exposure,” Rivera said. If you need someplace to go, the Red Cross has set up shelters at the following places with food and other essentials. They remain open Friday. For more information, call 774-204-5071. Officials recommended calling 211 for any other non-emergency services. What about my kids? Or my dog? Public and Catholic schools in Lawrence, Andover, and North Andover are closed Friday. Several of the shelters are located at schools and youth centers. Pets are also welcome at the Red Cross shelters, and the MSPCA’s Nevins Farm in Methuen is taking in animals who temporarily need shelter and care as well. What’s the status of other services? Lawrence General Hospital’s outpatient satellite offices are closed Friday, as are state offices in Lawrence. Office and classes at Northern Essex Community College are closed, though emergency staff and counseling will be on hand at the Haverhill campus for students in need of assistance. Some other businesses are also closed, so call ahead. Will I be able to get around? Many streets in the affected areas of Andover, North Andover, and South Lawrence remain closed, so commuting could be challenging, though highways in the area are reportedly running smoothly. The Merrimack Valley Regional Transit Authority said its Lawrence routes will not be running until further notice, but Haverhill routes, except for the Lawrence-Methuen-Haverhill shuttle, are running normally, and commuter service to Boston is running with a detour. The MBTA’s Haverhill Line on the commuter rail will only run as far north as Reading, with shuttles connecting stations in Haverhill and Bradford to the Anderson/Woburn station on the Lowell Line. In Lawrence, volunteers and donations are being collected at the Lawrence Senior Center, 155 Haverhill St.
Officials in Andover and North Andover say they have sufficient resources to continue to operate shelters, but contact the Red Cross at 774-204-5071 about the best ways to help.